The unsanctioned rally was organized via social networks [ru] in response to “Anatomy of a Protest,” a film produced by and aired on the state-controlled NTV channel on Thursday, March 15, which claimed, among other things, that those who attended recent opposition rallies had received “money and cookies” for their participation. 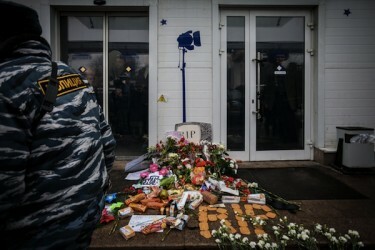 NTV's mock grave at the Funeral of the Truthful Television rally at Ostankino, Moscow. Photo by EVGENY FRANK, copyright © Demotix (18/03/12). On Friday, March 16, public outrage sparked by NTV's film gained momentum, with the hashtag #НТВлжет (“NTV lies”) soon becoming one of the top trending topics on Twitter. I'm watching yesterday's NTV “film.” And these people are called “journalists” too. I can't stay silent. But I can't allow myself to [use bad language] either ((. Chief Executive of lifenews.ru @gabrelyanov says to those complaining about NTV attack on the protests. “Watch Facebook” if u don't like TV. […] [A rally] either for freedom to political prisoners, or against NTV's lies, or just to have a chat. Spring is here, finally! Olga, I used to think differently, but I admit that you are right and I'm not. It's impossible for everyone to resign. Teachers at all schools, because there are dishonest ones, those who took part in falsifying [the election results]; journalists, because there are many corrupt and cynical, with no shame and consciousness; all the judges, because a huge number of judges have lost their human qualities. As [Niels Bohr] used to say, at least tiny pockets of decency should be preserved. Everywhere. A number of online anti-NTV initiatives have emerged in the past few days. In Russia, tv channel NTV (НТВ) issued a false statement alleging that the opposition to the ruling party is being paid by “money and cookies”. This group was created in order to call for a boycott of NTV and its advertisers. 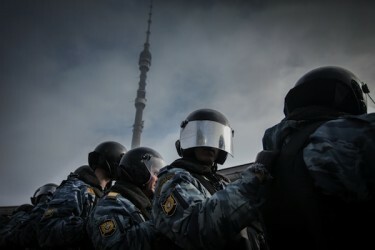 Riot police at the Funeral of the Truthful Television rally at Ostankino, Moscow. Photo by EVGENY FRANK, copyright © Demotix (18/03/12). Back in the offline world, at the March 18 Ostankino rally, the riot police, quite predictably, ended up detaining “about 100 protesters.” The echo of these detentions was best heard online, of course. He tweeted throughout his ride to a police station (during which he and other detainees were joking [ru] and singing [ru] Yuri Shevchuk‘s songs, as well as Katyusha, a Russian wartime song), and throughout his stay there [ru], and was released approximately four hours later, along with others. A young woman is being detained at the Funeral of the Truthful Television rally at Ostankino, Moscow. Photo by MARIA PLESHKOVA, copyright © Demotix (18/03/12).